Carbon Dioxide is plant food. Earth is currently in a “CO2 famine”. The geologic record reveals that ice ages have occurred when CO2 was at 2000ppm to as high as 8000ppm. In addition, peer-reviewed studies have documented that there have been temperatures similar to the present day on Earth when carbon dioxide was up to twenty times higher than today’s levels. And, a peer-reviewed study this year found that the present day carbon dioxide level of 400ppm was exceeded – without any human influence – 12,750 years ago when CO2 may have reached up to 425 ppm. Does an increase in the carbon dioxide content of the atmosphere increase global temperature or not? However an experiment conducted in 1909 shows this conclusion to be wrong – the atmosphere acts more like a radiator, quickly removing heat from land and water surfaces, transporting it aloft and radiating much of it back to space. The atmosphere is a great temperature moderator – it stops daytime temperatures from rising too high, and keeps night-time temperatures from falling as low as they would otherwise. The net result, averaged over the whole world, is not known, but the daytime shading probably has a greater effect on surface temperatures than the night-time insulation. 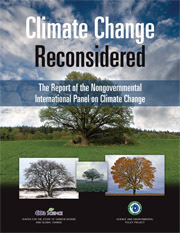 Klause Ermecke, 2010 – “Rescue from the Climate Saviours – Is there any Danger from “World Climate?” KE Research. Weather and climate are all about clouds, precipitation, evaporation, wind and temperature. The energy for all of these comes from the sun. With the failure of “Global Warming” the climatists have concocted a new alarm – the soda water scare. Their computer models are forecasting that the oceans, which weigh 300 times more than all the gases in the atmosphere, are being turned acidic by the 0.0012% (12 parts per million) of man-made additions to the carbon dioxide (CO2) in Earth’s atmosphere. When concentrated CO2 gas is bubbled under high pressure into ice cold water much CO2 dissolves, producing acidic soda water whose pH (acidity) could be as low as 4. This is 1,000 times more acidic than pure water whose pH is a neutral 7. This weak soda water could only be described as “acidic” by someone pushing an alarmist agenda. There are no measurements that show that the pH of the ocean is changing more now than in the past – only models. In historical terms, atmospheric CO2 levels are now close to record lows. Corals and other ocean life have flourished in atmospheric levels of CO2 far higher than today’s. We are told that the tiny bit of natural soda water in still-alkaline sea water will dissolve corals and shells, kill fish and create oceanic mayhem? If soda water is so dangerous, then how come people consume it in copious amounts in beer, scotch and fizzy drinks? Ocean acidification is like the Castle Ghost – everyone is scared of it but no one has seen it. Dozens of learned articles and millions of media words tell us that ocean acidity has increased alarmingly since man started using carbon fuels. The worry is that the carbon dioxide being generated by man’s industry is dissolving in the ocean thus creating acidic water. And the computer models forecast that, by some future date, sea shells and corals will be dissolved or killed by the acidic ocean and/or the associated global warming. It is a myth that acidic waters necessarily kill aquatic life. Rain water is slightly acidic and many fresh water lagoons, swamps and reed beds are also acidic. Nevertheless, aquatic life flourishes in these wetlands. The oceans have a huge capacity resist being destabilised by changes in temperature or composition of the atmosphere. Whenever there is a change, the reactions of other chemicals or life in the sea act to moderate and even reverse those changes. Oceans cover about 71% of the Earth’s surface and the hydrosphere contains over 300 times the mass of gases in the atmosphere. The oceans thus have a huge capacity to buffer any variations in heat content or gas content emanating from the thin veil of atmospheric gases. The effect of man’s supposed 3% contribution to the tiny 0.039% of carbon dioxide in the Earth’s thin atmosphere would not register a long-term effect in the massive oceans. Cold ocean currents from the deep ocean periodically up-well to the surface. These currents are rich in dissolved carbon dioxide and other chemicals and decayed organic matter. Where this cold nutrient-rich water surfaces, there is a staggering profusion of aquatic life. Oceans have an unlimited ability to remove carbon dioxide from their waters and store it in thick beds of shells and corals, limestone, chalk, dolomite, magnesite, siderite, marls, methane hydrate and oil shales. Fresh water swamps and lakes on land have also laid down massive deposits of coal and lignite formed from carbon dioxide extracted from the atmosphere. Many of these deposits were laid down when the carbon dioxide content of the atmosphere was far higher than it is today. Carbon dioxide present in the oceans is essential to plant life and current very low levels of carbon dioxide in the atmosphere and the ocean are limiting plant growth. All animal life depends on these plants. Man’s mining and industrial activities are harmlessly recycling some of this valuable carbon dioxide from natural limestones and hydrocarbons buried in the dead lithosphere, back to the living biosphere. Corals are hardy and adaptable and have survived for 500 million years. During that time they have had to cope with warm eras, ice ages, extinction events, eras of massive volcanic activity, dramatic rising and lowering in sea levels and eons of time when levels of atmospheric carbon dioxide were far higher than today. A very recent extensive study of the Great Barrier Reef concluded that the changes forecast under the “business as usual greenhouse gas emissions” were unlikely to cause great harm to the reef. Any change in global temperature or the carbon dioxide content of the atmosphere will cause life on land and in the ocean to adjust and adapt. However, on balance, a warmer world with more plant food in the atmosphere and a more vigorous water cycle is very beneficial for the biosphere. The killer climates are associated with ice ages when the atmosphere is cold and dry, the sea levels are much lower and much of Earth’s fresh water is locked up in vast lifeless sheets of ice. There is no justification to use the baseless fear of “acidification of the oceans” as an excuse for a massive dislocation of our transport, food and energy industries. We should instead be focussing on real pollution problems (such as man’s rubbish floating in the oceans) and/or on preparing to cope with real and likely natural disasters (such as earthquakes, volcanic eruptions, tsunamis, floods, fires, cyclones and droughts). At presentation to a seminar at the British House of Commons recently, Professor Lindzen clarified what the debate over climate change is really about. “It most certainly is not about whether climate is changing: it always is. “It is not about whether CO2 is increasing: it clearly is. “It is not about whether the increase in CO2, by itself, will lead to some warming: it should. “The debate is simply over the matter of how much warming the increase in CO2 can lead to, and the connection of such warming to the innumerable claimed catastrophes. The evidence is that the increase in CO2 will lead to very little warming, and that the connection of this minimal warming (or even significant warming) to the purported catastrophes is also minimal. The arguments on which the catastrophic claims are made are extremely weak – and commonly acknowledged as such. They are sometimes overtly dishonest. Prof Lindzen is the Alfred P. Sloan Professor of Meteorology, Department of Earth, Atmospheric and Planetary Sciences at MIT.